It has been done. The bike has finally been chosen. I know in my last post (which was aaaagggeeeeessss ago!) I had chosen my bike, and had gone for the Giant Avail 3. However since then things unexpectedly changed. Saturday I went with Anne back to the Giant store in Rutland to try out a couple of road bikes. This is the first time that I had been on a road bike for about 20 years, so I was quite nervous about how I was going to get on. As it turned out, I had no need to worry, and I really enjoyed it. So when we got back to the shop I was ready to buy the bike, slight snag, they didn't have any, it seems Giant had not made enough bikes for 2013! I have to say I was not impressed, how Anne put up with my temper I'm not sure but I'm pleased she was there, as I was close to buying the Avail 1 at £1000, totally blowing my measly £700 budget until she stepped in and advised me to spend 30 minutes thinking about it. This had totally thrown me, as I had done a lot of research into the Giant and everybody I had asked for advice had suggested the Giant, including @TheIron_Bear and Mary at @Inspire2Tri, so I was at a loss of what to do. So the decision was made to cut our losses with Giant and get back over to Leamington to have a look at what they have at The Bike Yard. This was a sensible suggestion so it obviously wasn't mine! I spent the journey back whining that I couldn't have what I wanted, Annes patience needs a huge prize!!! The trip to The Bike Yard was a success, and they were so helpful, really setting our minds at rest that they would find a bike within our budgets that fit us well. Unlike Giant at Rutland, they didn't dismiss the mens bikes, giving us more options for what we needed. I went back Tuesday for my fitting, where I was politely told that I have short legs and a long body, and short arms, apparently my "knuckles don't drag on the floor" which is pleasing! I had a long chat with them about what I wanted and my plans for half and full ironman over the next couple of years, they knew what they were talking about so I went for the same principle of when I shop for running trainers, get fitted and have what they tell me to that is in my budget. We tried a couple of bikes, the first being the Giant Defy 1 which because of my short arms and legs was no good even after a lot of fiddling around! The next that we tried was the Lapierre Audacio 300, which again after some fiddling around with and a lot of getting on and off the bike it seemed to be the bike for me, I was secretly pleased as it matches my trainers! I had a chat with them about shoes and peddles, I was unsure as to whether it was a good idea to get them straight away, but I was advised just to get them on and go for it, being told that I will fall off, and it will be funny to everyone around me! 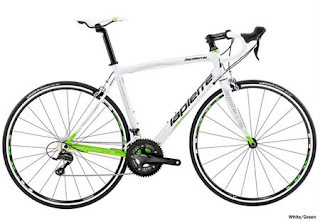 So, I decided to go for it and to buy the bike, shoes and pedals, which I pick up Saturday!